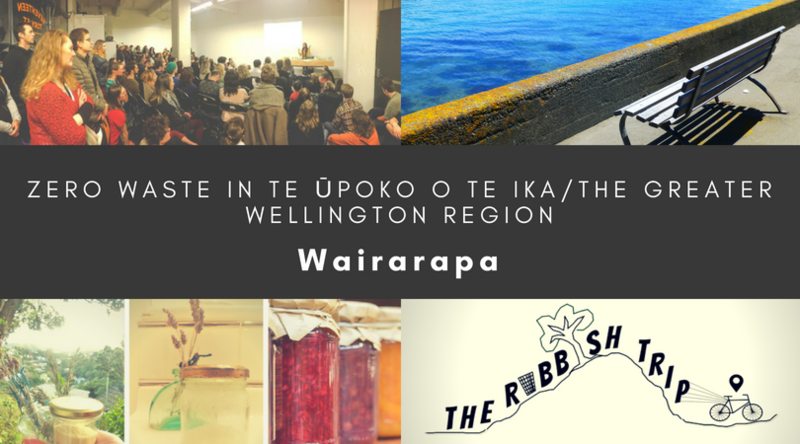 This guide covers Wairarapa only. For other parts of the Greater Wellington Region, please refer to the Zero Waste in the Greater Wellington Region homepage. Bin Inn Masterton, 333 Queen St, Masterton – offers a wide array of dried food in bulk (including, but not limited to, nuts, seeds, cereals, grains, flours, and legumes), a range of spices, liquid foods (including vinegars, oils – including local oil by Loopline (see below) – and syrups), and sweets and treats. They also have a peanut butter machine. All Bin Inn around New Zealand stores are currently offering 5% discount when you bring your own containers! Loopline Olives, 91 Loop Line, Lansdowne, Opaki – refill your BYO bottles with award-winning olive oil at the olivery (also at Bin Inn Masterton or Wairarapa Farmers’ Market). Supermarkets – most supermarkets have bulk bin/pick and mix sections with wholefoods (BYO bags for these). For example, you’ll find bulk bins at Fresh Choice, Greytown, 12 Hastwell St, Greytown and Four Square Martinborough, The Square, Martinborough. However supermarket bulk aisles tend to be pretty expensive, often more so than equivalent ingredients in packets (bah! ), and more so than the bulk bins at places like Bin Inn. But look out for when things in the bulk bin aisle in supermarkets are on special because sometimes you can get a good deal! Places that sell unpackaged meat, sausages, smallgoods, seafood, cheese and/or deli foods who will happily put your unwrapped purchases straight into a BYO container – woohoo! Moore Wilson’s, 120 Dixon St, Masterton – stocks Bostock’s organic free range chicken which comes in Econic home compostable packaging (except for the whole chicken packs). C’est Cheese, 19 Fitzherbert St, Featherston – will put cheese cut from the wheel into BYO containers. Kingsmeade Artisan Cheese will put cuts from the wheel into your BYO containers, but only at the Wairarapa Farmers’ Market, 4 Queen St North, Masterton (not at its physical store). Moore Wilson’s, 120 Dixon St, Masterton – stocks a range of bread from bakeries in the Wellington region – Pandoro, Bordeaux, The French Baker and more. Markets – No two ways about it, if you want to get a good source of unpackaged, often locally grown, produce, markets are the place to frequent! By and large, we’ve found that markets, where you can meet the grower/producer face-to-face, are really great for starting fruitful conversations about waste-free food, and developing relationships and systems that enable you to get your favourite fruit, vege and preserves without the packaging. For example, if the stallholder uses glass jars for packaging, ask whether they will take their empty glass jars back for sterilisation and reuse. Wairarapa has lots of lovely markets for fresh produce and other specialty items, whether it’s the Featherston Market, 33 Fitzherbert Street on a Saturday, the Carterton Farmers Market on Sundays at Memorial Square, or Masterton’s Sunday Car Boot Market, just bring your own bags and containers to avoid waste! On Saturday at Wairarapa Farmers’ Market, 4 Queen Street North, Masterton you can get low-waste goodies (for example, Kingsmeade Artisan Cheese will put cuts from the wheel into your BYO containers, Loopline Olives allows you to do oil refills into BYO bottles, and Papa Ora sells delicious kombucha and other dips and tasty treats in glass jars and bottles which you can return). Trade Aid – Trade Aid‘s entire chocolate range comes in Econic home compostable packaging! Their 2kg sugar bags are also great for upcycling as bulk bin bags, and are home compostable also. Trade Aid’s coconut oil is one of the few on the market that does not have a plastic seal around the lid. You can get all these products at Trade Aid Masterton, 96 Queen Street, Masterton. You can also find Trade Aid chocolate bars at Four Square Martinborough, The Square, Martinborough; Food Forest Organics, 101 Main St, Greytown; and Moore Wilson’s, 120 Dixon St, Masterton. Other pre-made food in home compostable packaging – Loving Earth raw chocolate comes in home compostable packaging and you can find it at Moore Wilson’s, 120 Dixon St, Masterton. You can get unpackaged pet food biscuits at PAK’nSAVE Masterton, Queen Street, Kuripuni, Masterton – just BYO containers. Coffee – wherever possible, we recommend looking out for places that sell whole or ground coffee beans unpackaged, and bringing your own bag and container to fill. You can do this at Wairarapa roasters Neighbourhood Coffee, The Square, Martinborough; and Gracias Coffee, roasted at Don Luciano, corner King and Chapel streets, Masterton. You can also buy unpackaged coffee beans at Bin Inn Masterton. If you’re into instant, go for Trade Aid‘s instant coffee, which comes in Econic home compostable packaging and is available at Trade Aid Masterton, 96 Queen Street. Milk – Wairarapa finally has a glass refill system for milk! This is available at Eketahuna Country Meats, 110a Bentley Street, Masterton – just BYO glass bottle or purchase one for $3 and return every week for a refill on site. If you’re desperate, get milk powder from the bulk bins at Bin Inn Masterton, 333 Queen St, Masterton. Beer – head to a brewery or liquor store that sells beer on tap where you can refill BYO bottles – places like Regent 58, 1a Stubbs Lane, Carterton or Beg, Borrow and Brew, 224 Norfolk Road, Carterton. Alternatively, most liquor stores do ‘swappa crates’ of beer – i.e. crates of twelve 745ml bottles of classic NZ beer (e.g. Lion Red/Brown, Speights, Tui, Export Gold etc.) which can be returned (when the bottles are empty) so that the bottles can then be sterilised and reused (a better outcome for glass bottles than recycling because reusing the same bottle over and over requires way less energy and resources than recycling). Say “no more” to disposable takeaway coffee cups and plastic water bottles by getting yourself reusables instead! Get reusable water bottles at Unichem Southend Pharmacy, 266 Queen Street, Masterton; Take Note, 80 High Street North, Carterton; Blackwell & Sons, 101 Main Street, Greytown; Linarte, 108 Main Street, Greytown; Flax Gallery, 96 Main Street, Greytown; Deluxe, 76 Main Street, Greytown. Another brand that does glass cups, Sol, is available at Moore Wilson’s, 120 Dixon St, Masterton and Clareville Bakery, 3340 SH2, Clareville. The Oasis Eco Cup is available at Take Note, 80 High Street North, Carterton. Plastic shopping bags are a menace, but so too are those plastic produce bags for fruit and vege or the plastic bags often offered alongside bulk bins at bulk stores. You can avoid them by bringing your own bags or buying a set of reusable produce bags. You can get 100% organic cotton produce and bulk bin bags by My Vita Bag at FreshChoice, 12 Hastwell Street, Greytown, or those by Rethink at Tryst on High, 40 High Street, Carterton. Get locally made produce bags at Carterton Craft Market, 80 High Street North, Carterton. There are also beautiful organic, fairtrade cotton shopping bags (look up the amazing ethical business model this company has!) at Wild Grey Fox, 81 Main Street, Greytown. Purchase at The Sanctuary, 209 Queen Street, Masterton; Room 2 Room, 152 Queen Street, Masterton (locally made, although annoyingly wrapped in plastic); Tryst on High, 40 High Street, Carterton; The Offering, 65 Main Street, Greytown (locally made, only in a paper packet); Linarte, 108 Main Street, Greytown (unpackaged). You can also get locally made beeswax wrap from local company Chalk and Cheese, just send them a message and they’ll make some up for you. If you’re local, you can arrange a pick up to avoid packaging cost and waste. DIY (waaaay cheaper): You just need to get natural fibre fabric (cotton) and unpackaged beeswax. For off-cuts of cotton, keep an eye out for discount/off-cut bins at secondhand stores and fabric stores or fat quarters at quilting stores. For example, check out Evans of Masterton, Cnr Bannister St and Dixon St, Masterton; The Embroidery Shop, 250 Queen Street, Masterton; Quilter’s Lane, 50a Queen St, Masterton; Carterton Craft Market, 80 High Street North, Carterton; and J E T, 130 Main Street, Greytown. Reusable sandwich bags – you can get reusable sandwich bags and/or wraps by Munch from Kuripuni Gift Shop, 437 Queen St, Masterton. You can find dishbrushes with wooden handles and removable + replaceable, home compostable heads Linarte, 108 Main Street, Greytown; Vintage European, 78 Main Street, Greytown (a range of brushes); and Deluxe, 76 Main Street, Greytown. You can also get Go Bamboo veggie brushes (which can also be used as a dishbrush, and are also home compostable) at Tryst on High, 40 High Street, Carterton; Vintage European, 78 Main Street, Greytown and Deluxe, 76 Main Street, Greytown. Get the SPRUCE 100% cotton/cellulose (home compostable) dishcloths at Tryst on High, 40 High Street, Carterton. Ask if someone will knit or crochet you a 100% cotton dishcloth at Carterton Craft Market, 80 High Street North, Carterton. If you want to try your hand at knitting/crocheting your own (do it! ), check out the recycled cotton yarn at The Embroidery Shop, 250 Queen Street, Masterton. Bin Inn Masterton, 333 Queen Street, Masterton – stocks a wide range of both liquid and powdered cleaning products/ingredients you can fill your own bottles and containers with. Eco Planet laundry powder comes in a cardboard box with a cardboard scoop – no plastic lining! You can get this at New World Masterton, corner Bruce and Queen Streets, Masterton; and New World Carterton, 60-72 High Street South, Carterton (which also stocks Next Generation laundry powder, which is the same deal – cardboard box, cardboard scoop, no plastic lining). Soap Nuts – these are a fruit that contains saponin and thus good for laundry. You can get That Red House Soapberries which come in a paper bag inside a cotton bag at Polka Dots, 446 Queen Street, Masterton. Bars of Laundry Soap – get from Medina, 113 Main Street, Greytown (made in store, totally unpackaged); and Linarte, 108 Main Street, Greytown (comes with a natural fibre/wooden scrubbing brush, wrapped in cardboard). Baking soda – available unpackaged in bulk bins at Bin Inn Masterton, 333 Queen St, Masterton. Bars of castile or Sunlight soap, which you can use as a base for homemade dishwashing and laundry liquid (see how it works here) – you can get Sunlight soap at New World Masterton, corner Bruce and Queen Streets, Masterton, and Countdown Masterton, corner Worksop & Queen Streets, Masterton. Bamboo toothbrushes – a great alternative to plastic toothbrushes because they have wooden, home compostable handles (though bristles are still plastic and need to be removed from the handle and put in a rubbish bin). You can find bamboo toothbrushes at Polka Dots, 446 Queen Street, Masterton (child size only); Unichem Southend Pharmacy, 266 Queen Street, Masterton; New World Masterton, corner Bruce and Queen Streets, Masterton; Countdown Masterton, corner Worksop & Queen Streets, Masterton; Tryst on High, 40 High Street, Carterton; New World Carterton, 60-72 High Street South, Carterton; FreshChoice, 12 Hastwell Street, Greytown; and Food Forest Organics, 101 Main St, Greytown. Dental Floss – at Countdown Masterton, corner Worksop & Queen Streets, Masterton, you can get Do Gooder floss, which comes in a refillable glass tube with a screw on metal lid. The WHITE floss is made of 100% silk and is home compostable (the black floss has polyester in it so is landfill only). When you run out of the floss, no need to get a new dispenser, you can get refills of the floss in cardboard and paper from www.dogooder.co.nz – just pop the refill into your original metal/glass dispenser. Look out for the popular Ethique range which includes shampoo bars, conditioner bars, shaving bars, deodorant bars, moisturiser bars, etc. (all of Ethique‘s bars come in home compostable packaging). We saw it stocked at Unichem Southend Pharmacy, 266 Queen Street, Masterton; Scented, 81 Main Street, Greytown. You can also get your hands on the Global Soap shampoo bars at Tryst on High, 40 High Street, Carterton. Reusable, washable pads made by North Canterbury-based Red Fox Reusables are available at Te Pātukituki o Wairarapa, 15 Queen Street, Masterton. Avoid plastic shavers that are designed to be disposable and go for 100% metal razors that will last you decades and only require the 100% metal and recyclable blades to be replaced (or sharpened with a leather strop! ), and remember to use a bar of shaving soap instead of shaving foam that comes in an aerosol can (see above) – note, you’ll need a shaving brush to make this work. You can buy razors, replacement blades, and shaving brushes at Jim’s Hairdressing, 4 Bannister Street, Masterton. You can get just shaving brushes at Unichem Southend Pharmacy, 266 Queen Street, Masterton; Taylor Road, 76 Main Street, Greytown. Baking Soda is an essential ingredient in lots of homemade toiletries such as toothpaste and deodorant, as well as a great general cleaner when teamed up with vinegar. You can get it unpackaged in bulk bins from Bin Inn Masterton, 333 Queen St, Masterton.